Indian Oil Corp., the nation’s second-largest refiner, said a fire at a terminal in Jaipur hasn’t affected output at its refinery in Mathura, which supplies fuels to the storage unit through pipeline. 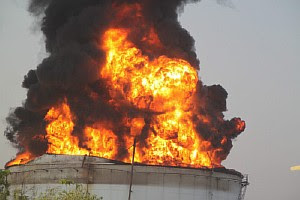 The terminal in Jaipur in the western state of Rajasthan caught fire late yesterday. Almost 270 army personnel have reached the site to help fight the blaze, which killed five people and injured 150, the Press Trust of India reported. The fire may have been caused by a leaking gasoline pipeline, N. Srikumar, Mumbai-based executive director, said by telephone yesterday. The Mathura refinery has installed capacity to process 8 million metric tons of oil annually, according to state-owned Indian Oil’s Web site.